Chinchillas look like a cross breed of a rabbit and a squirrel, but they are a species all their own. They are members of the rodent family (rats, mice, guinea pigs, etc..). They are originally from the Andes Mountains in South America. At one time their fur was used to make coats. I have heard that it takes over 200 chinchillas to make just one coat. That is such a sad loss of so many beautiful little animals. A chinchilla can be a wonderful house pet. They are cute and cuddly not to mention as soft as anything you will ever touch. There are some down sides to having a chinchilla, but I love mine so much I would never give him up. The downside with a chin is that if you are looking for a soft cuddly little friend who will sit on your lap and cuddle with you, you are not likely to find that in a chin. You are better off to get a cat if that is what your looking for. They can be affectionate but when they have the opportunity to be out their cages they would rather run and jump and play. It has been my personal experience that they do not like to sit still during "out time". They have allot of energy and since they spend a large portion of time in a cage, when they have the chance to go they will. They are a delight to watch as they try to run up the walls and jump around (although you need to take some precautions so that they do not get stuck in places they do not belong such as behind the TV or beside the stove). I found a cheap solution........I took big cardboard boxes and cut them into panels and blocked off unsafe areas. They can jump pretty high and they can climb well, but I found that is long as your watching this method works well. Never ever leave your chin completely unattended. They can get in to trouble fast. There are many different colors to pick from when choosing a chinchilla. The standard gray color is the least expensive. Beige and black are next in line and the whites, sapphires, mosaics and other colors are more expensive because they are considered to be rare. They are all very beautiful and since they can live for 20 years no matter how much you spend it will be well worth the money. Since chinchillas are from the mountains they are used to quite cold temperatures and should never be left in extreme heat. Any temperature over 75 degrees will cause the chin stress and a temperature of 80 degrees or higher can cause death. All you really need to house a chinchilla is a decent size metal cage, a water bottle and either a heavy food dish or one that hooks to the side of the cage. Some wood chips (not cedar) help in absorbing waste and a house for him to sleep is also nice to have. You can find all of these things at most pet stores. I have heard mixed stories about trying to litter train, but if you want to try you can find where in the cage your chin is wetting (usually in a corner) and put a litter pan there. I have not personally tried this with mine. When picking out a chin you will want to get one that is young or has been raised by someone who has paid it allot of attention. They can bite and they can be very shy, but if you get one when it is young you will have very good success in making him "people friendly". We also have allergies in my house and we have had no problems with chinchillas. This may be the perfect pet for people who have allergies and can not have other pets. I would recommend visiting some pet stores that have some if possible, and handling one. Go back several times if necessary and see if you have any reactions. Visit these great chinchilla links that I have found !!! 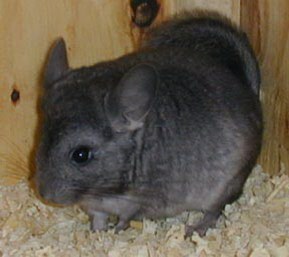 ChinNet - Information about Chinchillas, Owners, Breeders, Vets, Associations and More !